This includes just the physical coin(s) only. For routines you must already own any of the ebooks In-spy-ring or Con-spy-ring or 1089 Refreshed & Reloaded . The Inspyring Coin comes in two finishes – Glossy and Antique. You can either buy any one of them or both of them as a set. Make your selection above on the right. Inspyring Coin is specially created for the purpose of performing coin mentalism routines -- zero sleights involved. Most of the routines are self-working. Yet the routines are easy to learn and perform so that you can focus fully on your presentation. Just pop your Inspyring Coin into your wallet or pocket, learn the routines, and you are always ready to perform some amazing miracles. The size of the coins is a handy 30 mm (1.2 inches) in diameter. 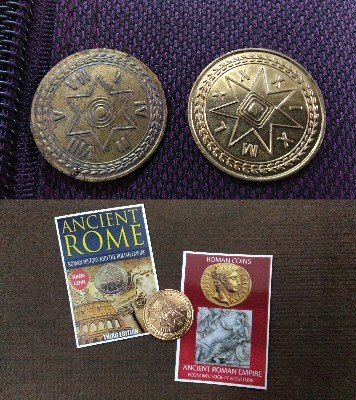 What you get: A glossy copper coin or an antique copper coin or a set of both (as per your order) which look like ancient Roman coins. And an 'authentication' card. Apart from the routines in the 3 suggested ebooks, there are other possible routines which can be done using some of the elements built into the coin. This coin is not magnetic so it neither attracts metals nor gets attracted to magnets. As a result, it can be freely handled by both the performer and participants. Inspyring Coin , then, is an ungimmicked and multipurpose coin. The Inspyring Coin is so nice to hold and look at that even without any of the included routines, it can simply be a great conversation starter and can lead to any other routines you may want to perform, depending on your style of presentation. Simple, easy-to-do and self-working routines, but with incredible impact on your audience. Zero sleights. No pre show, no stooges, no instant stooges, no dual reality, no magnets, no threads. The coins can be freely handled before, during and after the routines by both the performer and the participants. The massive number of routines in the 3 suggested ebooks include many types, such as predictions, divinations, coincidences, mind reading etc. A few sample effects are as follows. 1. CENTURY OF COINCIDENCE - (Part of Script) - "Have you heard of the Century of Coincidence? No? Well, this is something totally missed by historians but luckily discovered by magicians and mentalists. The 100 year war between the English and the French is actually a Century of Coincidence. And, weirdly, this gets proved every time we do a demonstration." The routine climaxes with some impossible revelations. 2. ATTITUDE WITH LATITUDE - (Part of Script) - "Geographically speaking, any point on Earth can be defined by a unique combination of latitude and longitude. Similarly, every thought that arises in the human mind can be defined by a unique combination of dreams and memories. Let's do a demonstration based on the latitude and longitude of human thoughts." The routine then uses some international telephone codes for an unbelievable climax. 3. ALPHA CONSPIRACY - What you do in this routine is no less than a conspiracy using the alphabet and a book (this is NOT a spelling routine). Hence the name Alpha Conspiracy and it has a double climax. This is a Book Test that can be done using any ungimmicked book. (Part of Script) - "According to linguistic research statistics, these 2 dozen words have been proven to have high impact on the human subconscious mind." And the routine ends with a thundering double climax. The above examples just a few of the over 18 routines in the 3 suggested ebooks combined, along with several bonus ideas.